Hammond reviewed the literature on the use of neurofeedback in cases of anxiety disorders, including posttraumatic stress disorder, obsessive compulsive disorder and depression. He noted that pharmacologic treatment may not be as effective as previously believed. EEG biofeedback was associated with minimal side effects and was less invasive than other methods for addressing biologic brain disorders. Moore reviewed the literature on the EEG biofeedback treatment of anxiety disorders. He noted that alfa, theta, alfa-theta enhancements are effective and alfa suppression is less effective. Recently Saldanha et al. studied the efficacy of EEG, electro myography, electro-dermal and thermal biofeedback in stress-related disorders and compared it with that of pharmacological intervention. They found that a judicious combination of biofeedback with pharmacotherapy works better, and also that a period of 12 weeks of training and exercise on biofeedback is adequate for any patient. Most of the psychiatric centers of the armed forcers have biofeedback equipments, and some are having the latest computerized systems procured under the modernization plan. However, their use has been limited due to inadequate in-service data of their efficacy. Hence there is a need for systematic evaluation of efficacy of biofeedback in the management of anxiety. This study has been undertaken in this direction with a view to facilitate optimal utilization of available modern equipments. This study was carried out in a multispecialty Command Hospital. One hundred patients with definite psychiatric diagnosis, including those from both inpatient and outpatient services, were taken up for the study. The diagnosis was established clinically as per international classification of diseases (ICD-10) criteria. Patients with past history of head injury, seizure disorders, hypertension, or diabetes mellitus were excluded from the study. Also psychotic, uncooperative and unwilling patients were not recruited for the study. Written informed consent was obtained from all patients. A pro forma data sheet specifically designed to gather psychosocial data was used. Patients were divided into two groups by allocating consecutive patients alternately. The anxiety level was assessed initially (phase 1) using Hamilton Anxiety Scale (HAS)  and Taylor's Manifest Anxiety Scale (TMAS). One group of 50 patients (study group) was treated with Alfa EEG biofeedback sessions, 5 times in a week for 8 weeks, and no benzodiazepines for anxiety were administered to them. The other group (control group) was treated with appropriate dose of anxiolytics. The anxiety level was reassessed after 4 weeks (phase 2) and 8 weeks (phase 3). The data collected were analyzed using the statistical analysis software Pepi. All the 50 patients in the study and control groups completed the study protocol. Almost equal numbers of inpatients and outpatients were recruited for both the groups. The mean age was 29.6 years in study group and 31.2 years in the control group. All the cases were fresh, and the duration varied from 6 months to 15 months. Mean duration of the illness was 9.6 months for the study group and 8.7 months for the control group. Social variables like marital status, rural/ urban domicile and educational status were comparable between the groups. Almost two thirds of the patients had illness for less than 6 months when they were taken up for the study. In both the groups, there was almost similar representation for both the sexes. Mixed anxiety and depressive disorder was the most common psychiatric diagnosis in both the sexes, but obsessive compulsive disorder was overrepresented among females. 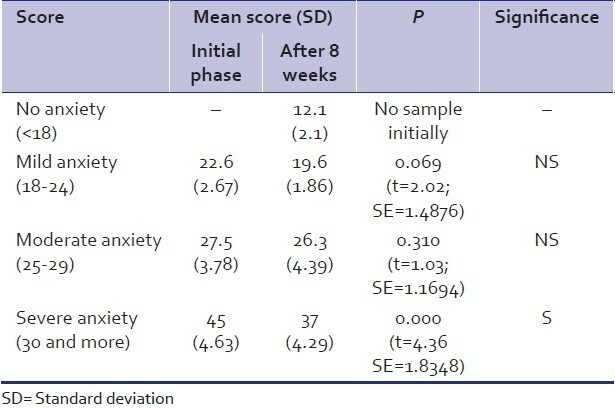 In the study group, at the beginning of the study 13 patients showed severe anxiety on Hamilton Anxiety Scale (HAS) [Table 1]. This number came down to 12 by the end of 4 weeks; and to 11, by the end of 8 weeks. But 28 patients had moderate anxiety in the beginning; this number came down significantly to 24 by the end of 4 weeks; and to 21, by the end of 8 weeks. Mild anxiety was noted in 9 patients initially, decreasing to 7 patients by 4 weeks and to 4 patients by the end of 8 weeks of therapy. Also 14 of the patients showed no anxiety on HAS score by the end of 8 weeks of therapy. 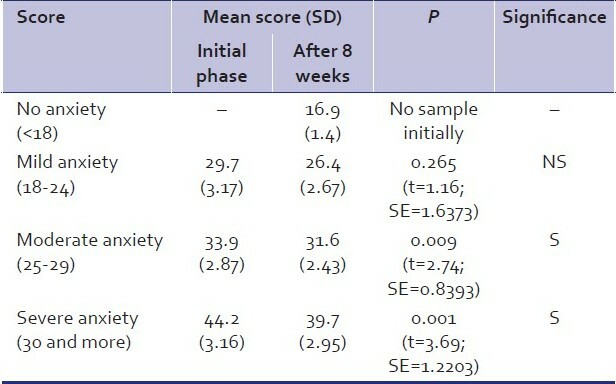 The mean HAS score in the beginning was 45 in the severe anxiety group, 27.5 in moderate anxiety group and 22.6 in mild anxiety group, which came down to 37, 26.3 and 19.6, respectively, by the end of 8 weeks of therapy [Table 2]. With Taylor's Manifest Anxiety Scale (TMAS), in the beginning of the study, 15 patients of the study group showed severe anxiety [Table 3]; this number came down to 13 by the end of 4 weeks; and to 11 patients, by the end of 8 weeks of therapy. Twenty-four patients had moderate anxiety initially; this number came down to 21 by the end of 4 weeks; and to 18, by the end of the study. Similarly there were 11 patients with mild anxiety initially; 8, by the end of 4 weeks; and 5 patients, by the end of 8 weeks. Also by the end of 8 weeks, 16 patients showed no anxiety on TMAS. The mean TMAS score in the beginning was 44.2 in the severe anxiety group, 33.9 in the moderate anxiety group and 29.7 in the mild anxiety group , which came down to 39.7, 31.6 and 26.4 by eight weeks respectively. Analysis of reduction in mean TMAS score showed that there was no significant reduction in the mild anxiety group [Table 4], but the reduction was statistically significant in both moderate and severe anxiety groups. Various syndromal psychiatric disorders with prominent anxiety symptoms were taken up in this study for both study group and control group. The distributions of social variables and psychiatric diagnoses were comparable between groups. The diagnosis was made clinically using ICD-10 criteria. But for the objective assessment of the level of anxiety, two well-validated psychometric scales, namely, Hamilton Anxiety Scale (HAS) and Taylor's Manifest Anxiety Scale (TMAS), were used. By combining these two scales, one could assess the maximum number of measurable symptoms of anxiety. In both the groups, the improvement over the treatment duration was noticed in cases with all the psychiatric diagnoses; however, the response was better for mixed anxiety and depressive disorder in the control group using anxiolytics than in the study group using biofeedback. This is probably because of the prominent depressive symptoms which have not been documented to be sensitive to biofeedback therapy. Similar findings have been noticed by Col. Saldanha et al., but it was noticed that cases of generalized anxiety disorder (GAD) and obsessive compulsive disorder (OCD) in both the groups improved better than those of other diagnostic categories. This is in line with the findings by Rice et al. In the study group, female patients showed better response by the end of 8 weeks of treatment, whereas the response was almost similar between the sexes in the control group. Female patients were more willing to use biofeedback therapy versus medication and were more regular in attending the sessions than the male patients. It has been shown in the past that patients with high belief in biofeedback therapy respond better to it. Probably, similar factors played a key role in the efficacy of therapy in the study group. Improvement with biofeedback therapy was noticed even by the end of 4 weeks and continued uniformly till the end of 8 weeks of therapy. Using HAS, no significant difference was noticed in efficacy between biofeedback and pharmacotherapy in the mild and severe anxiety patients of the two groups, but biofeedback was less efficacious than pharmacotherapy for the moderate anxiety group. Also, the number of patients with no anxiety at the end of 8 weeks was higher in the control group. On TMAS score, the improvement was more pronounced in the control group, but patients with severe anxiety showed better response with biofeedback than with pharmacotherapy. To conclude, this study has shown that in the short term, EEG biofeedback therapy is almost as efficacious as pharmacological intervention in the management of anxiety symptoms of patients with psychiatric diagnoses. It was found to be relatively more useful in females and those with GAD and OCD. However, it will not be prudent to generalize the above findings due to certain limitations of the study. Due to certain limitations with regard to duration of hospitalization for serving soldiers, the study duration was planned for 8 weeks only. Continued benefit of the biofeedback therapy over a longer duration and absence of recurrence of symptoms on cessation of therapy can only be assessed when the treatment is followed up for a longer duration. 1. Agas Ws, Wilson GT. Learning Theory. In: Kaplan H, Saddock B, editors. Comprehensive Text Book of Psychiatry. 7 th ed. Baltimore: William and Wilkins; 2000. 2. Hammond DC. Neurofeedback with anxiety and affective disorders. Child Adolesc Psychiatr Clin N Am 2005;14:105-23. 3. Moore NC. A review of EEG biofeedback treatment of anxiety disorders. Clin Electroencephalogr 2000;31:1-6. 4. Sattar FA, Valdiya PS. Review article - Biofeedback in medical practice. Medical journal of armed forces of India 1999;55:51-5. 5. Saldanha D, Chaudhury S, Pawar AA, Ryali VS, Srivastava K. Reduction in drug prescription using Biofeedback relaxation in Neurotic and Psychosomatic disorders. Medical journal of armed forces of India 2007;63:315-7. 6. WHO. ICD - 10 Classification of mental and behavioural disorders. WHO. Walton Street, Oxford: Oxford University Press; 1992. P. 75. 7. Hamilton M. The assessment of anxiety scales by rating. Br J Med Psychol 1959;32:50-5. 8. Taylor J. A personalty scale of manifest anxiety. J Abnorm Soc Psychol 1953;48:285-90. 9. Rice KM, Blanchard EB, Purcell M. Biofeedback treatments of generalized anxiety disorder: Preliminary results. Biofeedback Self Regul 1993;18:93-105. 10. Wickramasekera I. How does biofeedback reduce clinical symptoms and do memories and beliefs have biological consequences? Toward a model of mind-body healing. Appl Psychophysiol Biofeedback 1999;24:91-105.